LDV has confirmed that itâ€™s all new Ute, the LDV T60, will enter the Australian market in 1 October, followed six weeks later by the D90 SUV on 15 November, transforming LDVâ€™s position in Australia from an all-van brand to one with benchmark models in the key Ute and SUV market sectors. Both launches will be preceded by a major event in Sydney on 25 September which will be attended by senior management not just from LDV, but also its parent company, SAIC, Chinaâ€™s number one vehicle manufacturer. They will be joined by a large contingent of Chinese business and motoring media along with VIP guests. 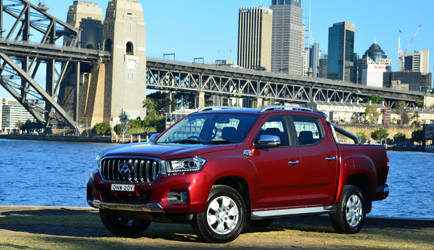 LDV has deliberately chosen Sydney as the venue to provide global visibility for the D90 and T60. First seen at last yearâ€™s Guangzhou International Motor Show in China, the LDV T60 is an all-new vehicle which will expand to offer Australian buyers a range of single and double cab, two and four-wheel drive, manual and automatic Utes with two trim and equipment levels. The LDV D90 made its debut in Australia, with a sneak preview of the full-size SUV on the south coast of New South Wales and in Sydney, prior to its official unveiling at the Shanghai International Motor Show earlier this year. The D90 was in Australia for dynamic testing and calibration of its advanced chassis electronics prior to its launch. The T60 and D90 will not only launch the Chinese commercial vehicle specialist manufacturer into new market sectors, they will also take LDV into new parts of Australia. â€œIn short, these two new models will transform LDVâ€™s position in the market, awareness of the brand across the country and, of course, the number of vehicles we will sell,â€ says Chinnappa. The LDV T60 launch model line-up will expand following the launch to include a range of turbo diesel powered 4WD dual cabs with both manual and automatic transmissions, as well as 2WD and 4WD cab chassis with manual transmissions. There will be two trim and equipment levels to ensure coverage of the market from working business vehicles to recreational and family transport. â€œThis model line-up covers the most significant part of the market and these versions will be joined by additional variants as required to meet changing market demands,â€ says Dinesh Chinnappa. At 5.3 metres long and 1.9 metres wide and with a 110 kW 2.8 litre Turbo Diesel engine, the LDV T60 will sit right in the middle of the key Ute market sector in terms of size and performance, but when it comes to equipment, features and pricing, the T60 will continue the LDV market position of value for money pricing and above average equipment, trim and features. Full details of the Australian D90 range will be made closer to its November 15 launch. The LDV range opens with the LDV G10 one tonne van, which is now available with a new Turbo Diesel engine with a choice of manual or automatic gearboxes from a recommended retail price of $28,990 driveaway for ABN holders. The new powertrain compliments the petrol variants, which start from a recommended retail price of $25,990 driveaway and include a 165 kW turbocharged power unit for the automatic petrol powered G10 van. No lesser value proposition, the G10 is also available as an accomplished people mover, with a choice of seven and nine seats, both powered by the 165 kW petrol engine with a six speed ZF gearbox and priced from a recommended retail price of $29,990 driveaway. The LDV V80 van range comes with a choice of two wheelbases and three roof heights, giving it a range of cargo volumes from 6.4 to 11.6 cubic metres and payloads from 1.2 to 1.4 tonnes. It is powered by a 2.5 litre Turbo Diesel engine with a choice of manual or self-shifting gearboxes. Prices start for the V80 vans are from a recommended retail price of $30,490 driveaway for ABN holders. All LDV vehicles come with a three year/100,000 km warranty with 24 hour roadside assistance. They are supported by a growing nationwide dealer network, backed by Australasiaâ€™s largest locally owned independent vehicle distributor, the Ateco Group. The Ateco Parts Distribution Centre in Sydney employs the latest automated parts distribution technology to deliver parts across its Australia-wide dealer network. The LDV Technical Training Team equips all dealer technicians with the knowledge and skills to service and maintain all LDV models, using the both the Ateco Training Centre in Sydney and with training courses in LDV dealerships across Australia. LDV is a division of SAIC, the 46th largest company in the world and, with more than seven million vehicles set to be produced in 2017, the largest vehicle manufacturer in China, the worldâ€™s largest car market.